Teachers: Di & Heather. (Level 2) Each month a different set of stitches is taught that can be made into a “stitch page", added to your crazy patch, or a special project. April – We will jump into our second session of the bead-dazzled Christmas tree. May – We are bringing back our faithful feather stitch- worked up, modified and embellished to your hearts content. 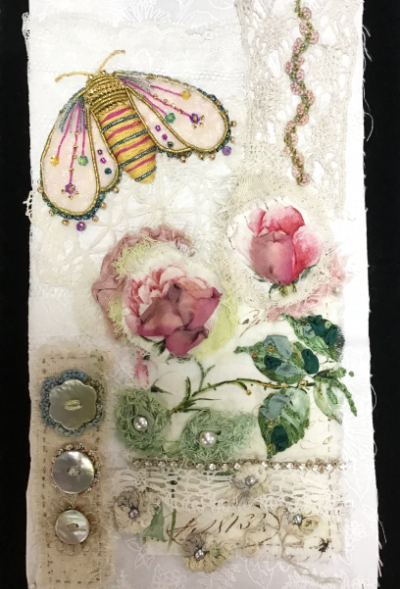 June – We will be using felt, beads, Sadi thread and some thread embroidery to create these wearable pins which can be incorporated as a motif in your crazy patch or as a pendant for a necklace! You choose what suits you best. A supply list will be emailed.